Does Pyromancer's Goggles copy ability work with flashback, entwine, kicker, madness, overload? Does Prism Ring work for copied spells? : Add to your mana pool. When that mana is spent to cast a red instant or sorcery spell, copy that spell and you may choose new targets for the copy. 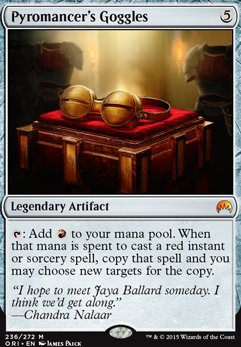 what about Pyromancer's Goggles ? Needs a Thought Vessel and some Pyromancer's Goggles . I really like this commander. 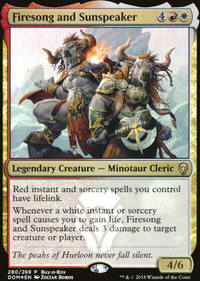 What a great direction for boros to go. Have you considered Aetherflux Reservoir and Sentinel Tower I could see them being potent with the recoverable instants. Especially cards with card draw cantrips. Also Pyromancer's Goggles and Eerie Interlude repeatable group board wipe evasion! You'd probably use Pyromancer's Goggles to cast Howl of the Horde to give you the most number of duplicates since copying Banefire or Reverberate will only create one extra Banefire cast. Also for future reference, you can put card names inside square brackets [ [ CardName ] ] without the spaces to link to the card so people can know immediately which cards you're talking about. Riku of the two reflections draws a bit of hate so make sure to protect him with Swiftfoot Boots and Lightning Greaves . 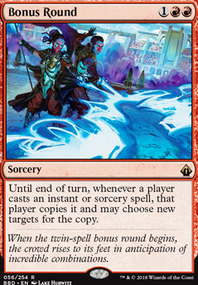 The medallions are okay for cost reduction, but only if you are chaining spells of the same color. Ramp spells Kodama's Reach or mana rocks Darksteel Ingot , more signets might be better. I suggest something like Pyromancer's Goggles to get an extra copy of that game ending Banefire . Why kill two players when you can kill three? Wort, the Raidmother is another way to get an extra copy. Vedalken Orrery is great for letting you keep mana open. Especially if you find yourself using that Alchemist's Refuge a lot. Early Harvest allows you to get a lot of extra mana for the turn you plan to combo off. 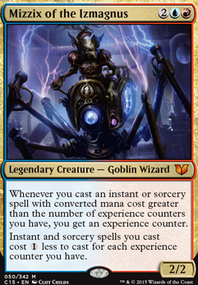 Baral, Chief of Compliance seems weird with only a few counters, I understand you want the cost reduction and I was wondering how consistent has this been for you? Love the Spellseeker ! Great way to find your x spells. How do you feel about the Spellheart Chimera vs Crackling Drake vs Enigma Drake ? Trample seems like it might make the chimera the best of these cards. Let me start by saying I've been playing Mizzix since he was released, and I've constantly strived to make my [[Primer]] Knowledge & Flame deck the best it can be. I'd like to believe with a 96% competitive rating, and the fact that I RARELY lose with the deck means it's a solid deck. As such it has seen several iterations and I've tried playing all kinds of cards... So here's a bit of advice. I only have 17 cards that aren't spells that Mizzix can discount, 6 of which is Ramp. I only have two creatures, Niv-Mizzet, Parun (I'm testing him for extra draw power and secondary win con) and Laboratory Maniac as one of my main win cons. Of the 9 cards remaining 2 cards help me with consistent draw power, 2 are to protect Mizzix, 2 win me the game, and the rest are just there. Now I'm telling you all this because even with me having so little cards that aren't reduced by Mizzix I STILL end up with them sitting in my hand for ages for fear of tapping out and not having a counterspell up. So there are a lot of cards you have in this deck that do not directly add to your winning... And some cards that just don't play well with a deck that wants to either combo out or burn everyone into the ground. Invert // Invent: Invert does nothing really, and Invent is WAY too expensive for what it does. Keranos, God Of Storms: Great card, but honestly it's just a win more card, this won't win you the game. Blatant Thievery: It's a great card, but it always felt lackluster for me because it requires your opponents to have a good board state, which obviously you don't want. I'd suggest Aethersnatch in it's place because then your opponent just plays a spell for you. 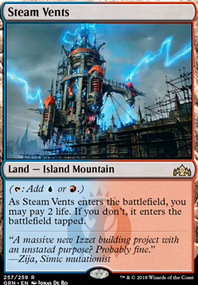 Ignite Memories/Mind's Desire: Storm cards are good but they don't get you the game. In fact I have whiffed both of those spells more times than I can count! I'd say go for something a bit more certain. Mizzium Mortars: I just think that this doesn't kill a LOT of creatures in this format Blasphemous Act is strictly better. Sentinel Tower: It just makes you a target, unless you are committing to storm. Future Sight: As a blue player you always want people to assume you have a counterspell, or don't want others to know you have a counterspell... This crushes that. If you REALLY need this effect, which I think isn't worthwhile, Precognition Field is better. Sunbird's Invocation: WAY TOO EXPENSIVE, and it's strictly just a win more card. I know I stated a lot of cards are too expensive and you are playing mizzix but assume mizzix isn't on the table because he will be killed or a target 90% of the time. The Usuals: I know it's expensive but... Mana Drain , Force of Will , and Pact of Negation I feel are absolutely necessary for this deck. Lightning Bolt : I know someone told you to take this out... but... Firemind's plus 4 experience counters means you win the game. You dig for infinite mana with Reiterat+Reality Spasm/Desperate Ritual and grab lightning bolt to copy infinite times with infinite mana casting reiterate on it infinitely. It's a one card combo basically. Power Sink : At worst its a counterspell at best it forces someone to pass turn. 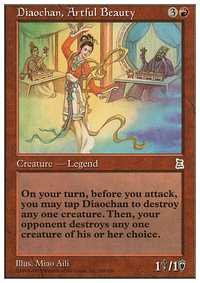 Disallow : One of the best counters in the game. Sorry I know I posted a lot but I'm really passionate about this deck, and I love to see mizzix players succeed.